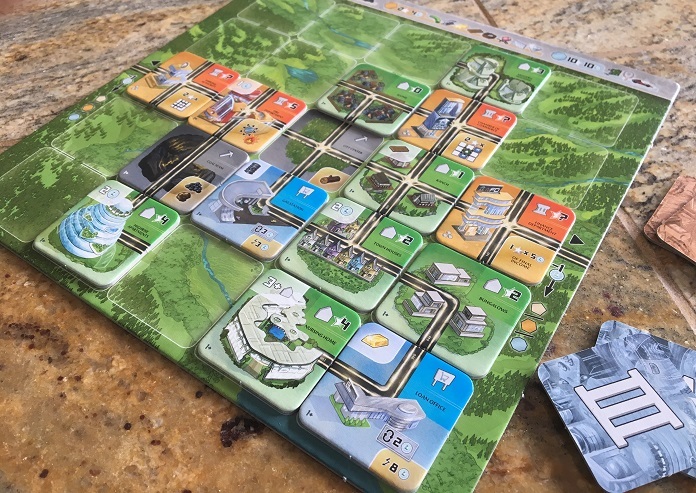 From designer Paul Sottonsanti and Lookout Games, NEOM is a new, city-building game which finds players drafting tiles and carefully arranging them on a gridded player board. Like a cross between familiar classics such as 7 Wonders, Carcassonne, and Suburbia, there’s a lot in NEOM to please a nice range of gamers. Each player gets their own board depicting a square grid and a unique landscape; they’ll also have a starting tile in the center which grants them access to one of the game’s ever-useful raw goods. Then, players pass around stacks of “Cornerstone” tiles, taking one and passing the rest along until each has three. Your cornerstone tiles are among the most important choices you’ll make in the game – the bonus points they’ll provide at the end of the game are tempting enough that they may shape your strategy for the entire game. A park, for example, rewards players who surround it with polluting tiles. (While in most situations pollution will have you subtract from your score.) A metro station, as a second example, will deliver big points for a player having tiles in the corner spaces of their board. These cornerstone tiles are plentiful, and their variety ensures a player’s strategy will be different each time they play. The general game spans three generations, each with its own pool of tiles you’ll be selecting from. A generation is made up of seven turns in which players select a tile, pass the pile, and then take an action. The tiles represent a wide variety of (mostly) urban structures, from factories to apartment buildings to power plants to insurance firms. More often than not, your action will be to place the tile you’ve chosen somewhere on your city board. There are two rules governing where you can and can’t put your tiles. The first is that you must meet the tile’s requirements, be they a monetary cost (which you pay from your coin supply into the bank), or having certain tile types or raw good produced within your city already. (To prevent this from potentially being too limiting, the game allows players to buy goods from other players.) The second requirement is that the new tile connects to your city center via the roads depicted on it. Unlike a typical tile-dropping game like Carcassonne (or, heck, even Tetris), NEOM does not let you rotate your pieces; they must always be placed so that their text can be read right-side-up. If you ever can’t place any of the tiles in your hand, or simply don’t want to place any of them, you’re not out of luck. You can pawn any location tile for money, re-stocking your coffers for future moves. Alternatively, you can discard it and place a cornerstone tile, but only once per generation. You’ll usually have to do these actions once or more during a generation, if only to boost your score via the cornerstone tiles. Each generation offers a new stack of increasingly complex tiles to draft one. In later rounds you’ll be dealing with processed goods, and even luxury goods. You’ll also have a very finite number of disaster tiles, which are a good way to really mess up your friends’ best-laid plans. Disaster tiles come in three flavors: flood, fire, or crime spree. (We’ll cross our fingers that a future expansion adds “plague of locusts” and “four horsemen.”) If you choose one of these tiles, you don’t have the option to sell it or discard it to play a cornerstone: you have to play the disaster. These are nasty effects, forcing players to pay a tax on their placed tiles of removed them from their boards, and disasters only harm your opponents and not you. They’re a quick way to make everyone around the table very, very angry with you. At the end of each generation, players collect income from tiles within their city. At the end of three generations, you collect one last harvest of cash and then tally up your scores. Scoring is a reasonably complicated affair that calls for many steps, but there’s nothing there that should catch a player off-guard. The bulk of points come from placed tiles, produced goods, leftover money, and having large neighborhoods of connected residential tiles. NEOM utilizes quite a few symbols, but after one game’s worth of learning curve you should have the grasp of most of them and be able to tell how well (or poorly) you’re doing in future sessions. NEOM doesn’t necessarily break any new ground, but it does take a bunch of tried-and-true mechanics and combine them quite swimmingly into a single board game. At a medium-high level of complexity, it should hit a sweet spot for most seasoned gamers, scratching the same itches as several heavier or more fiddly city builders. NEOM is a fun game that needs more than one play to truly appreciate. We’re going to go out on a limb and predict this to be a sleeper hit – while not as flashy, art-wise, as some of the hottest new releases on the market, there’s more than enough meat on this bone for it to pick up steam among seasoned gamers. Perhaps most worth noting is just how well NEOM scales to a wide range of player counts. The regular game is intended for three to five players, with a few special rules to make it playable with two. The game comes with a solo mode out of the box, which is a nice addition – it plays like a puzzle, and cleverly works around the drafting element you’ll obviously miss without any fellow players. Unlike many games with slapped-together solo variants, this one captures a similar flavor to the normal version of the game. 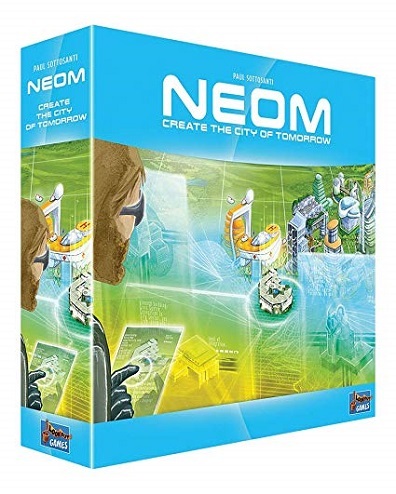 NEOM is from Lookout Games, and retails for an MSRP of $49.99. Previous PLAYlist columns: Crusaders: Thy Will Be Done, Reykholt, Pandemic, Everdell, Kingdomino, Citrus, History of the World, Altiplano, Pioneer Days, Crystal Clans, Jurassic Park: Danger!, Photosynthesis, Ice Cool, Food Truck Champion, Ars Alchimia & Lemuria, A Game of Thrones Catan, Troyes, Twilight Imperium: Fourth Edition, Flip Ships, NMBR 9, Unearth, Escape from 100 Million B.C., Orleans (plus Trade & Intrigue), Whistle Stop, Caverna: Cave vs Cave, Twilight Struggle, Honshu, Bärenpark, Notre Dame & In the Year of the Dragon, Yokohama, Clank! A Deck-Building Adventure, Villages of Valeria, New York Slice, Watson & Holmes, Hanamikoji. thanks for you. Your website is excellent.